Katherine needs money and she has to earn a large amount as quickly as possible. That's why she accepts a job on Little Bear Island. She's staying and working at the lighthouse and the island will be her home for several months. Bennet has been living on the island for two years. He writes music and works on a ferry to make ends meet. When Katherine arrives he sees something in her, something he thought he'd left behind. Bennet keeps running into Katherine. She feels right at home on Little Bear Island and has made more friends in two weeks than he has in two years. While Katherine improves both of their social lives Bennet starts to think of her as more than just a friend. She's his muse and finally, after a long period of writer's block, he can write songs again. Katherine isn't in a relationship, but she isn't entirely free either. Will Bennet have a chance with her or has she already given her heart to someone else? Summer Girl is a sweet romantic story. I immediately liked Katherine. She does what is expected of her, but due to those expectations she keeps losing parts of her own identity. Doing something by herself enables her to make her own decisions and it was great to see her grow. She makes progress and bit by bit the hidden part of her personality comes to the surface. She's sympathetic and caring and when life is tough she's strong enough to handle everything that comes her way, she never complains. She's a lovely woman and Bennet likes both the way she looks and who she is inside. He wants to help her to find herself. Bennet is a creative and kindhearted guy. He can be stubborn and sometimes he and Katherine have conflicts. Through them they discover what they want in life, which always made them a meaningful part of the story. They're also part of their amazing chemistry. I loved Little Bear Island. A.S. Green's descriptions make it come to life really well. The beautiful setting is a great place for a romantic book. The island is small and the inhabitants are fun to read about. A.S. Green has chosen a remote and peaceful location for her story, but a lot can happen when two people like each other. Especially when they both have emotional baggage and are keeping secrets. The descriptions of the past of both of the main characters enable the reader to get to know them very well. I couldn't wait to find out how their story would end. 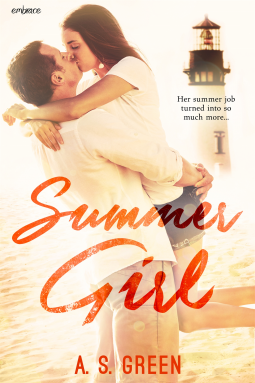 Summer Girl is the perfect holiday read. A.S. Green alternates between Bennet and Katherine and I enjoyed reading the story from two different angles. The book kept me entertained for hours and I loved it from the start. There are a lot of surprising elements and the ending has a fantastic revelation. I loved this wonderful heartwarming story. Thanks for the review it sounds really sweet. I agree with the beautiful setting. Her YA books had the same feel. It had such vivid scenery. I also didn't expect the twist and turns in the end! While it was not a major focus of your review, it really resonated with me when you stated that "a lot can happen when two people like each other." Meaning (in part), to me, that bells and whistles are not needed in a love story. Love/romance isn't the elaborate setting, the complex network of friends and Hims and Hers and Hes and Shes, or the dozen roses. It's just love. Thanks again for yet another a great review, and and for fueling my desire to develop my superpowers. Sounds like a good book, thanks for the review!